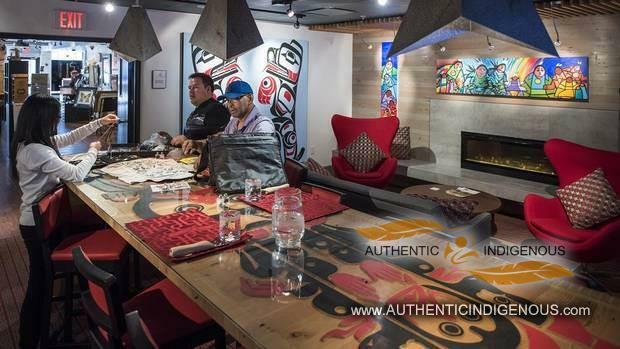 The Urban Aboriginal Fair Trade Gallery is a social enterprise created by Vancouver Native Housing Society (VNHS) to provide a community owned resource for Aboriginal artists. The project grew out of a communications program, Looking Forward Looking Back, that looked at Vancouver’s Downtown Eastside through the eyes of Aboriginal artists. This site iis a community driven initiative dedicated to sharing the artistic and cultural work of the urban Aboriginal community. There are many exciting projects underway and this site has been created to share them with our neighbours and friends on Vancouver’s Eastside and beyond. We invite you to watch our mural video below of the unveiling ceremony and blessing of the beautiful new Aboriginal mural on the west wall of the Orwell Hotel at 456 East Hastings.